Suffice to say, Lovell's Blade doesn't stray far from their roots with this new material. Essentially, they still play melodic heavy metal with a significant rock groove. There's some brisk heavy riffage and some solid blistering solos. The rhythm section delivers a deep and thundering undercurrent, yet adds rock groove. Then you have Lovell's clean, melodic, yet raspy and whiskey soaked vocals. That pretty much sums up the sound. As for the songs, I had some ambivalence to the album at the start with Legend In A Day and Dynamite, which didn't connect with me, and still haven't. They simply seem generic and bland. But things got much better with Rollin' On, a storming rocker and groove monster, and very catchy. The songs that followed, such as Devil's Daughter, Nothing To Lose, the speedy Out For Blood, and the arena anthem Rise And Fall, also turned up the rhythm and groove, yet delivering more AOR sensibility as well. Into The Sun was something of anthemic ballad, rather long at that, making it a bit tiring. But the guitar solo soared. Then unexpectedly with the last two songs, Inside Out and As Much As I Can, my ambivalence returned and I lost interest. Counting that out, I mostly liked the middle five songs, with Into The Sun getting an honorable mention. Nevertheless, with Stone Cold Steel, Lovell's Blade delivers classic hard and heavy melodic rock goods, and fans of the same should explore this album. 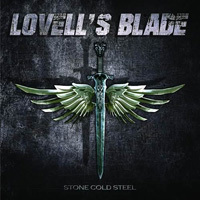 With Stone Cold Steel, Lovell's Blade delivers classic hard and heavy melodic rock goods, and fans of the same should explore this album.